A case for compensation for climate change destruction? Weaknesses of small states in dealing with global environmental issues that mortally affect them have become very evident in the pre-conference negotiations for the UN Conference on Sustainable Development being held in Rio de Janeiro, Brazil, from 20-23 June. Small states have few experts in this area and even fewer experts who are also capable negotiators. Consequently, many small states – including some in the Caribbean – have either been under-represented at the pre-Conference negotiations, or they have not been represented at all. In the result, small states issues may be raised at the conference and in its margins, but they will not get the attention that they urgently need now. Indeed, the pre-conference negotiations demonstrate that the conference is likely to witness a backtracking by developed countries on firm commitments they gave in Rio, 20 years ago at the first Earth Summit, especially financing. Small islands and countries with low-lying coastal areas are now at high risk from global warming and sea-level rise. This has been repeated so often that even the people of small states seem to have become immune to the catastrophic effects that they are facing. It seems that almost every government in the world is waiting for disaster before they act. It is almost as if, at secret meetings in closeted rooms, big decision-makers have taken the view that small countries are expendable, because their populations are tiny and their contribution to global trade, global finance, global technology are so small as not to matter, whereas addressing their problems – albeit caused by the polluters of the globe – is too costly and not worth it. Small states may be swiftly becoming collateral damage even though the large polluting countries of the world dare not say so. This is worsened by conditions in the world economy that has given new rise to nationalism and protectionism by large countries even as they coerce smaller ones into opening up their economies. If we are to measure the commitment of large polluting countries by their deeds, the worrying signs are everywhere. They have already reneged on the delivery of financing for mitigating climate change, and in the pre-Rio+20 negotiations, they have backtracked on fundamental principles agreed 20 years ago. Yet, apart from rhetoric, no red flag is being raised by governments of small countries collectively. They have not moved their words into action. There appears to be a collective sitting on hands, waiting for the polluting countries to be driven, by their own consciences, into action. To be fair, however, it could also simply be the case that, overwhelmed by the lack of expertise and resources, the authorities in small island states are paralyzed. But, by taking no collective action, governments of small countries are in danger of being complicit with the polluting nations in neglecting their own plight. If they wait too late to wake up to the absolute necessity of defending their own existence, not even survival might be possible. This may all sound like hyperbole and exaggeration. But the facts debunk those likely assertions. Well-publicized, authoritative studies show that sea-level rise will not only erode coastal areas affecting beach tourism, it will also dislocate hundreds of thousands of people from their homes, and it will also adversely affect food production. This reality strengthens the case for small states to fashion joint machinery to fight their corner in these negotiations. Many of the issues that confront them are sufficiently common for joint positions to be taken and a mandate given for joint negotiations. The first Earth Conference was held in 1992. In the 20 years that have elapsed groupings of small states, such as the Caribbean Community (CARICOM), have had time in which to develop joint machinery for research and bargaining on their collective behalf, especially as the global environmental situation worsened before their very eyes, hurting their countries. There has been a brave attempt by the Alliance of Small Island States (AOSIS) which is a group of representatives of small countries at the UN to forge and argue a collective position. That is good as far as it goes. But, lacking in resources, a firm mandate from governments and agreed machinery to bargain collectively, AOSIS is simply a moral force. And, it is a moral force that is reliant on non-governmental organizations (NGO’s) to provide the small states with the studies and information on issues that affect them. 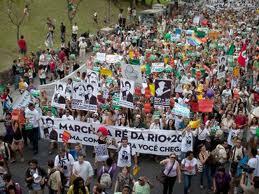 Small states, should not expect transforming benefits from the Rio+20 Conference. The only representatives likely to leave Rio satisfied are those who are the major polluters, and who benefit from continuing business as usual. It is relatively easy to pick out which countries those are by the leaders who are not attending. Among the notable absentees will be leaders of countries that are among the world’s top ten polluting nations. They are David Cameron of Britain, Stephen Harper of Canada, Angela Merkel of Germany, and, at the time of writing, Barack Obama of the US. While France’s new President, Francois Hollande, has said he would attend, he holds out no hope for any advance. He is right in his assessment that governments of the developed world are now preoccupied with the effects of the Eurozone debt crisis and the real risk of its knock-on effects in other major economies that are exposed to the banking system in Euro currency countries. The chances of them taking radical decisions and making progressive commitments that are necessary for global sustainable development are nil. None of this is to say that there have not been achievements since 1972 when the environment first became an issue. More than 500 environmental agreements have been signed. If signed agreements show progress then progress has occurred, but which small state can monitor all those agreements, and how many of these agreements have addressed the problems of small countries meaningfully? The two big agreements, the Convention on Biological Diversity and the UN Framework Convention on Climate Change remain suppressed. Rio+20 will undoubtedly produce an “outcomes document”, but it will have little for small countries for whom sustainable development is most urgently required. They should move now to establish strong, joint negotiating machinery that cannot be ignored in any future forum on this issue so vital to their survival. CARICOM should lead the way.